This game offers you to play so many cool mini-games, where you can use all your skills and even your reaction. Cool, yeah? Enjoy the game right now and win each of them! Are you ready? Then go ahead! Good luck! Would you like to play with the little guys? They have always so much fun! The objective of the game is to complete short mini games before the time runs out. The more mini-games you complete, the more mini-games you can unlock. Join Clarence on his day off. Participate in series of mini challenges. How many challenges can you complete before your 3 lives run out. Test of reaction time and rapid fire challenges. But, we sure that you are really quick and can do everything depending on you! The only one advice to you, just do not stop and be in a hurry! 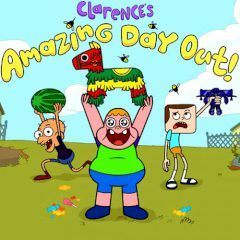 Games Similar Clarence's Amazing Day out!